The type of grip you use depends in part on the type of job you’re doing and the size of the knife. The grip illustrated in this picture is one of the most frequently used for general cutting and slicing. Many chefs feel that actually grasping the blade with the thumb and forefinger in this manner gives them the greatest control. This grip is called the pinch. 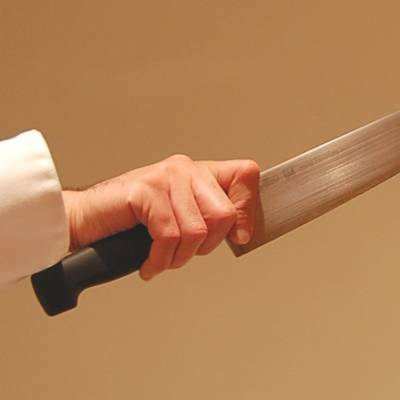 Holding the knife may feel awkward at first, but practice will make is seem natural. 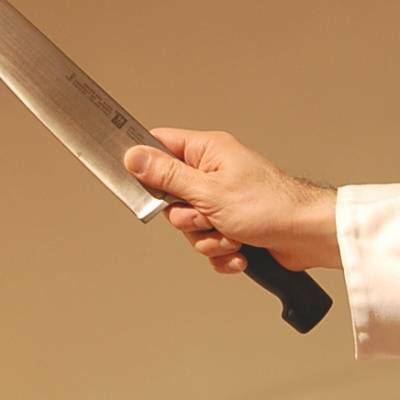 2. guide the hand – the knife blade slides against the fingers. The position of the hand controls the cut. 3. protects the hand from being cut – fingertips are curled under, out of the way of the blade. This is called the claw grip.